Lance.. Are we done yet? Have just finished reading Wheelmen (http://tinyurl.com/othmek6) the latest in a long series of books dealing with doping in cycling. The book was written by two Wall Street Journal reporters and while that doesn’t sound like the obvious place for cycling stories the paper does have its place in the timeline. It was the WSJ that published a copy of the email Floyd Landis wrote in 2010 revealing his own doping and the systematic use of performance enhancing drugs by the US Postal team. Wheelmen isn’t the Landis story, but his is inextricably linked to the books main character Lance Armstrong. It was a question of sticking with Wheelmen initially as the first few chapters have been done before by many writers (including those directly collaborating with him) on Lance’s early life growing up in Texas and emerging as a talented junior cyclist. The book has also been edited to try and explain the sport to the lay reader. Would Wheelmen have any appeal to a non cyclist? The writers clearly think so as they believe that the Armstrong doping story is the ‘greatest sports conspiracy ever’. Considering that this is one the books key strap lines the premise isn’t that obvious when reading it. What underscores the narrative is Armstrong’s place as a cancer survivor as much as the fame he achieved as a cyclist. As a cycling fan the story of Lance the cancer survivor is more often secondary to the tale of the erstwhile 7 times TdF winner and in placing as much emphasis on his role within the cancer community it might explain the spoon fed cycling insights. Wheelmen begins to come alive once you have read the early biographical chapters. As soon as the subject matter is doping the pace picks up and the book starts to read more like a police procedural. It’s not that much of what is told hasn’t been said before. There are however some insights that even if unsubstantiated provide more context and understanding of some of the allegations that remain, particularly about the UCI. Take for example the suggestion that Lance ‘paid’ for drugs tests to be covered up. In detailing Armstrong’s financial arrangements and the structure of the organisations built around the USPS team, the book reveals that Thom Weisel provided investment advice for Lance and Hein Verbruggen (UCI President at the time). The implication seems to be that a stock tip from someone in Armstrong’s inner circle could have given Verbruggen the potential for great returns. With profits described as 40% and higher elsewhere in the book it doesn’t take much to join the dots. Rather like saying that he had never failed a drugs test as opposed to saying I have never doped. In unpicking the wreckage of Armstrong’s lost endorsements it also becomes clear that what seems most important to him is to be able to return to competitive sport. Over the last couple of weeks Lance has been back in the public eye dropping less than subtle hints about what he is prepared to offer up in order to get a reduction in his lifetime ban. Obviously it would be good to see Armstrong confirm all of the stories that remain in the ‘believed to be true’ category. Wheelmen quotes Armstrong telling a friend “..I never ratted anyone out”. In this mindset it’s hard to see how progress can be made if Lance believes it isn’t for him to name names. While the situation would be better served by a ‘truth and reconciliation’ type process being established by the UCI under Brian Cookson it is hard to see Armstrong achieving the goal of a reduced ban if he remains equivocal about what he knows. 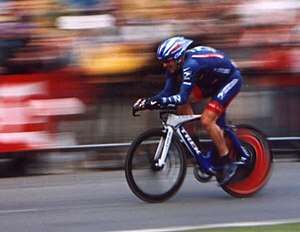 Although he has walked away from the sport Tyler Hamilton, arguably almost as divisive a character as Armstrong, achieved some kind of redemption in many people’s eyes by his warts and all approach in The Secret Race (http://tinyurl.com/qac7e9m). Hamilton has publicly encouraged Armstrong to take a similar path. although in Twitter exchanges the enmity between the two remains clear. Another disgraced rider has just published his own tell all story from the darkest days of cycling. In a flurry of leaks and interviews Michael Rasmussen described his own doping while revealing several high profile past and present riders who he alleged had doped also. One, Ryder Hesjedal was quick to confirm that he had doped in the past and it was quietly slipped out that he had already spoken to the Canadian anti doping agency and would serve a six month ban. In the absence of truth and reconciliation the possibility of riders having their previous or even current doping exposed by way of tell all book seems the most likely way that use of PED’s will be exposed. There is cynicism that ex riders like Hamilton and Rasmussen are only telling their truth’s now as they have nothing left to lose. There is some irony in that the lies of their pasts stretch with fans their credibility now. If we interpret Wheelmen a certain way Armstrong comes over as a man who will sacrifice everything to compete. Whether this was his morality when trashing the reputations of people like Betsy Andreu or Greg Lemond while doping his way to flawed victories in the Tour or accepting the losses of his endorsements now to compete in Triathlons. Perhaps he will go down the book route himself like his nemesis Hamilton. The context for this post is not to be for or against a reduction in Armstrong’s lifetime ban. As things stand it seems appropriate that as he has reaped he has sown. Should that be reviewed in the event of Lance bringing something meaningful to the debate? Potentially yes. However, he is right about one thing; he was not the only rider to dope. Ultimately it needs to be some kind of truth and reconciliation process to allow the least savory aspect cycling’s recent history to be laid to rest. As for Wheelmen, it’s possibly best read in a triumvirate with Hamilton’s The Secret Race and Jeremy Whittle’s Bad Blood (http://tinyurl.com/ptzhbvy) which sets the scene for the later revelations that followed nicely. Bad Blood conveys the Omerta that continues to exist in the peloton today and provides an insight into the scandal that shaped Armstrong’s first Tour win, the Festina affair.